With a seating capacity for 460 persons, this one of the best Auditoriums is equipped with projection screen for screening of spiritual documentaries and serials. 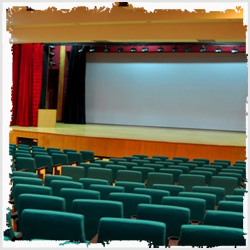 The Auditorium has modern facilities for staging plays, organising cultural presentations, spiritual Conferences, Seminars, Convocations, Workshops, live performances by artists, Bhajan Sandhya, Parvachans and Discourses by spiritual Gurus, Satsang, Jagran, Song and Drama Festivals and varied other functions arranged by spiritual and educational organisations. Special arrangements have been made in the Auditorium for telecasting of live Aarti from Shri Mata Vaishno Devi Bhawan.